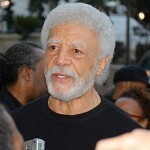 Born in Oakland, Calif., Ronald V. Dellums earned his MSW from the University of California, Berkeley. He served on the Berkeley City Council, was mayor of Oakland from 2007-2011, before being elected to Congress. 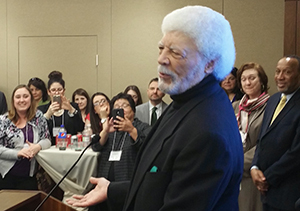 Dellums was an advocate and community organizer throughout his career, representing social work values in the political arena. Dellums represented California’s Oakland Congressional District from 1970-1998. He chaired the House Armed Services Subcommittee on Research and Development. He was a member of the Subcommittee on Investigations and of the Defense Policy Panel. In 1988, he was elected chair of the Congressional Black Caucus. He was the principal Congressional leader in the effort to curb and reverse military spending and the nuclear arms race and a leader in the effort to terminate U.S. government support for the apartheid regime in South Africa. He consistently challenged the militarization of U.S. foreign policy in Central America and repeatedly voted against military aid to governments there.